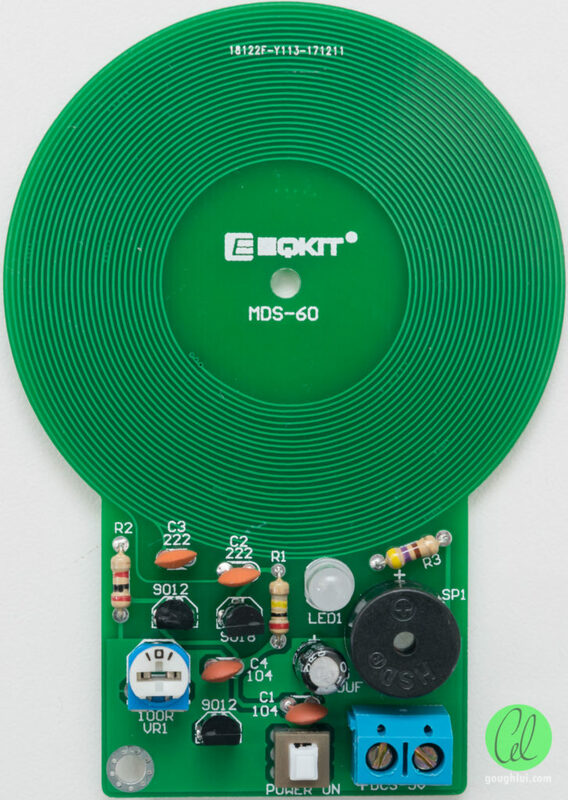 As a fan of building kits, my crusade to try building random cheap-Chinese kits continues with this EQKit MDS-60 Electronic Metal Detector Kit which I managed to get for AU$1.84. Being such a low-cost item, we don’t expect to build a practical metal detector (the kind you’d walk to a beach with to scan for loose change), but we might have something that does do … something? Another plastic zip-lock bag … we know the drill by now! Not unexpectedly, for a low-cost kit, the number of components are only just a handful – resistors, transistors, capacitors, an LED, buzzer, potentiometer, switch and terminal block. Still nice to see they didn’t skimp on the switch or terminal block … EQKit seems to make rather decent stuff. The PCB is a double-sided fibreglass board with white skilscreen on the top and soldermask on both sides. The PCB is a work of art with its printed trace inductor coil – a close look at the silkscreen sees little soldermask cut-outs which say EQKIT around the circumference of the windings. That’s attention to detail and a quality PCB manufacture to get these to register exactly. Unfortunately, no instructions nor schematics were supplied. … a relatively trouble-free build with some fairly tight transistor pad spacing (a thin iron is best) but due to careful board design with thermal-isolation on pads near ground planes, it was a breeze to construct. Testing it was as simple as applying 5V to the unit and adjusting the sensitivity until it beeped, and backing off slightly. Introducing some metal resulted in the detector “going off”, as it should. Magic! But then I thought … well, how does it work exactly? So I traced out a schematic. Because of the point-to-point type double-side layout, it took me a while to get something which seemed sensible, but errors may still exist. Looking at the drive of the coil on the oscilloscope seems to suggest it oscillates at about 275kHz. NDB band users probably won’t enjoy the radiation that might be emitted from this – it’s probably functioning as a low-power CW transmitter! Introducing some metal into the equation changes its frequency due to a change in inductance but there are now some spikes measured on the base of a transistor in the design (I don’t remember which) – this is probably the small signal that is being amplified signifying detection? I’m not entirely sure … maybe I should have a proper sit-and-think about this one. For such a low-cost kit, this one was a bit of a surprise. It definitely does detect metal at a fairly short (10cm) range depending on your sensitivity setting. But the quality of the PCB was excellent, with some delicate details and layout. Unfortunately, it didn’t come with explanations or schematics, so I did some tracing but yet, without enough time to fully study it, I’m not much wiser as to how it works. I suspect the central coil is a drive coil with the outer loop as a sense coil, so perhaps the coupling is what is used to detect metal (due to permeability increasing coupling much like how a core in a transformer increases coupling). But probing with the oscilloscope seems to suggest another possibility – perhaps the circuit is designed as a “tuned” circuit and the change in inductance with the introduction of metal throws off the phase relationship of the feedback resulting in a voltage developing that is successively amplified as the output. Either way, it was a fun kit to play with, along with its annoying buzzer. The PCB coil is in my opinion, a work of art. This entry was posted in Electronics and tagged cheap, ebay, electronics, kit, made-in-china, reverse engineer, schematic. Bookmark the permalink.